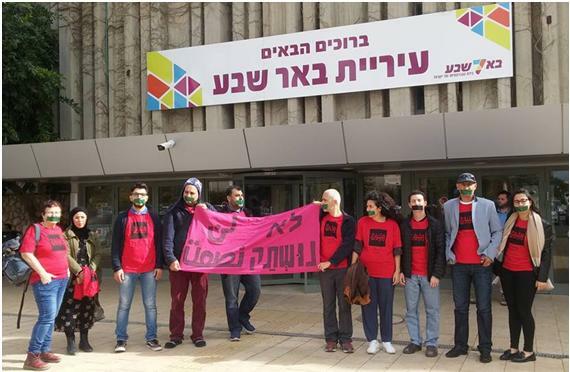 The city of Beer Sheva is attempting to evict the Negev Coexistence Forum for Civil Equality from its municipality-provided community center, “Multaka-Mifgash” (Encounter) following a concerted effort by far-right extremists. This is the only place where Jews and Arabs can meet in the southern city to work together to promote equality and understanding. Since 1996, the Forum has been operating out of a Jewish-Arab community center, located in a renovated bomb shelter. During each of Israel’s subsequent wars, the shelter turned community center has been kept open to the public during all hours of the day. It is probably the best kept shelter in town, and more importantly, it is the only place in Beer Sheva where Jews and Arabs can meet socially, hosting a wide range of community and cultural events — including courses in Arabic, film festivals, literary evenings, and lectures. Between October 2016 and April 2017, the Forum held a number of events that caused far-right extremists to take action, demanding the municipality cancel them: an evening with Yesh Gvul, a veteran group of conscientious objectors who refuse to serve in the Palestinian occupied territories. The event was held as planned. The saga continued when the Forum, together with the Association for Civil Rights in Israel (ACRI), held a workshop on photography during demonstrations, leading to accusations that it was fomenting provocation against the police. The situation came to a head in late 2017 when the Forum hosted a lecture about the sale of Israeli arms to dictatorial regimes. In December, following hysterical accusations that the Forum was engaging in anti-Israel propaganda and besmirching the good name of the Israeli military, the municipality gave the Forum two weeks to vacate the shelter. What is truly deeply troubling is not the fate of the Forum, nor the baseless accusations of subversion and treachery. What is a stake is freedom of speech, the freedom to criticize state institutions, to flout conventional wisdom, and challenge the consensus. The real issue is that, in Israel today, any cooperation or solidarity between Jews and Arabs is seen as deeply political and subversive. This is the real reason behind the targeting and persecution of the Forum.